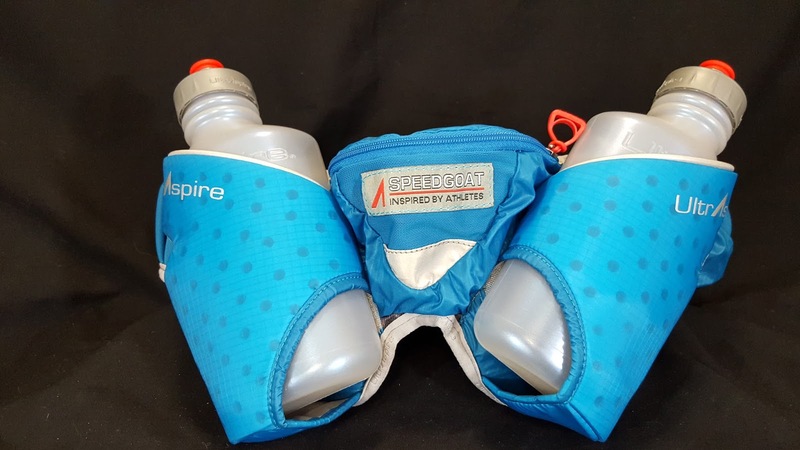 UltrAspire was founded by Bryce Thatcher, who has been designing running products for quite a while. It was always a dream of Bryce’s to build packs for other people that he would choose for himself without worrying about the price, volume, or mass production of the units. He simply wants to provide extraordinary choices for extraordinary people. 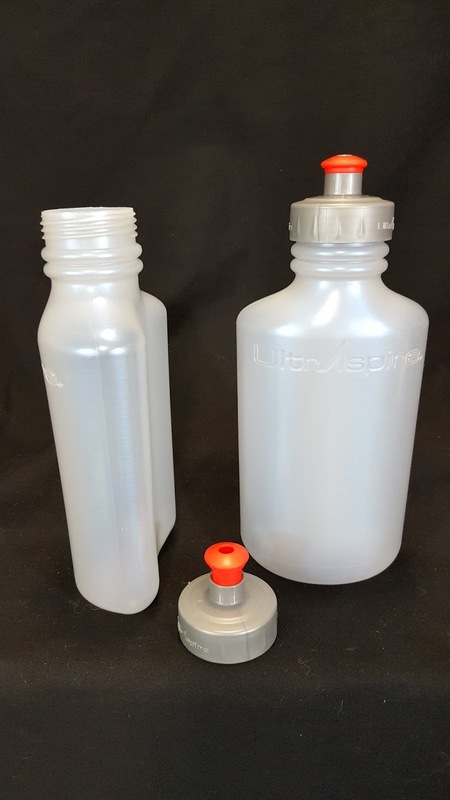 UltrAspire came up with a unique design for the Isomeric Pocket Handheld Bottle. 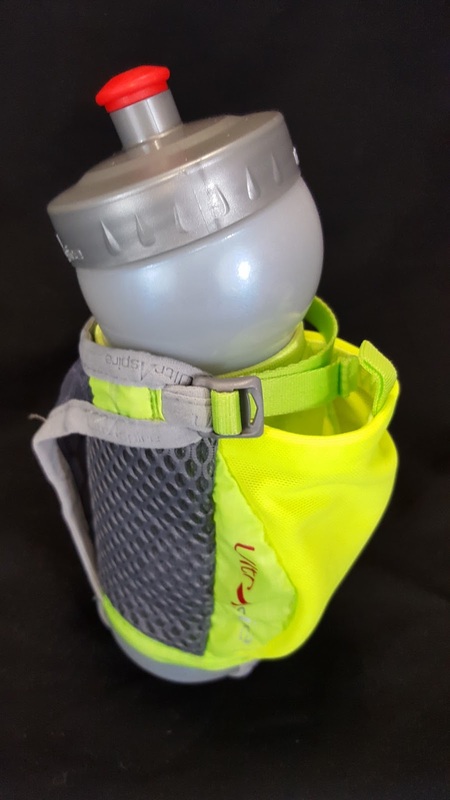 It has a curved neck to make it easier to drink while on the run. When I first saw this design, I knew I had to test it out. There are several features that make this handheld bottle stand out. The 20 ounce “Human” bottle that is ultra-soft, which makes it easy to squeeze. Like I said above, the angled shape makes it easy to drink and hold comfortably in your hand. Traditional water bottles require you to tilt your head back a lot farther. The “Human” bottle is much more comfortable to use. The screw-on cap does not leak and has a push-pull top. The area between the bottle and your hand is made with a ventilated material that keeps your hand dry and comfortable and will keep your hand from freezing from the ice water in your bottle. That is a great feature! It also eliminates condensation from getting all over your hand. The stretch mesh pocket is large and really does stretch. It is big enough to fit my Samsung Galaxy S6 with its case. That is a rare thing with the handhelds that I tested. The hand strap is made with a soft microfiber material for wiping your face. It is also breathable to keep your hand dry. The hand strap is lined with a very comfortable material to avoid irritation from rubbing. Unlike most hand straps, the Isomeric Pocket Handheld is tightened from the side instead of the top. I found that this lets you tighten the hand strap with ease for a better fit. I am a fan of the Isomeric Pocket Handheld for its many innovative features including the angled bottle, large pocket and insulation between your hand and the bottle. You can pick up yours for $26.95 from the UltrAspire website or at a store near you (click here for locations). The Speedgoat is about to be released from UltrAspire this month. It is extremely comfortable and has tons of features. Its predecessor, the Impulse was inspired by and developed exclusively for Karl Meltzer, a legend in the ultra-running community. The Speedgoat has two angled holsters for easy access that securely holds the two ultra-soft and squeezable 550ml (18.6 ounce) bottles. The holsters lock in the bottles so they don’t fall out mid run, but still allow easy retrieval of the bottles. The two bottles are softer than most bottles out there. This makes it easy to squeeze, especially after you have been running for a while and it is hard to squeeze the bottle. I know that has happened to me before. The bottles come with caps that feature a push-pull top. There is a mesh and fabric center pocket in the back (between the bottles) that is large enough to hold a jacket and another zippered pocket on the right side for gels and keys. Both pockets are too small to hold my Samsung Galaxy S6 with its case though. There is also a trash pocket on the left side of the belt. 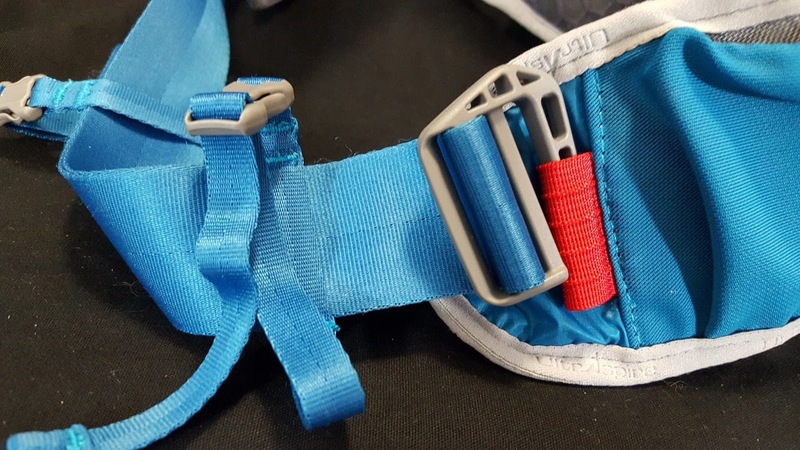 The belt is extremely comfortable and you put it on with a hook system instead of a buckle. The belt does not flex, but the fit is great and doesn’t loosen throughout your run. The edges have a soft and supple perimeter binding made with polyester to wick away moisture and stay comfortable against your skin. It would even be comfortable even with your shirt off, if that is how you like to run. 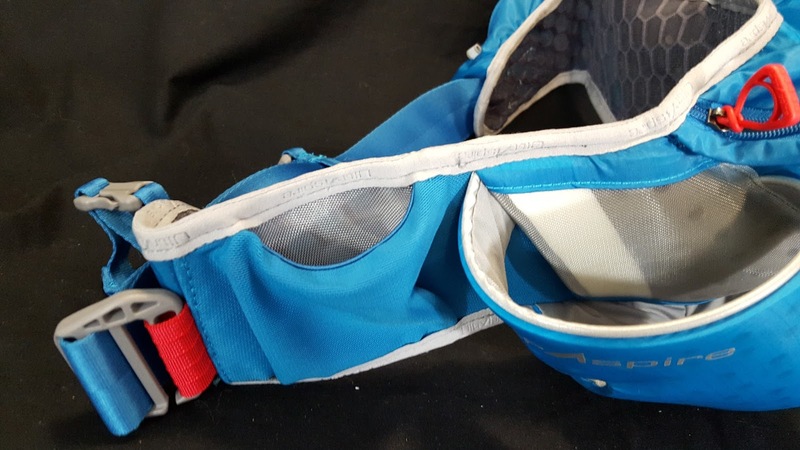 There are two removable quick access front straps that you can use to secure a jacket, z-poles, or other accessories that you no longer need to wear. I wish more companies would use something like this on their belts. Overall I really like the Speedgoat. The amount of water it can hold, the comfortable design and breathable materials make the Speedgoat a great pack that should hold up for years. My biggest issue with the Speedgoat is that it doesn’t have a big enough pocket to hold my phone. You can pick up yours for $79.99 from the UltrAspire website or at a store near you (click here for locations). UltrAspire strives to make its customer return process hassle free. 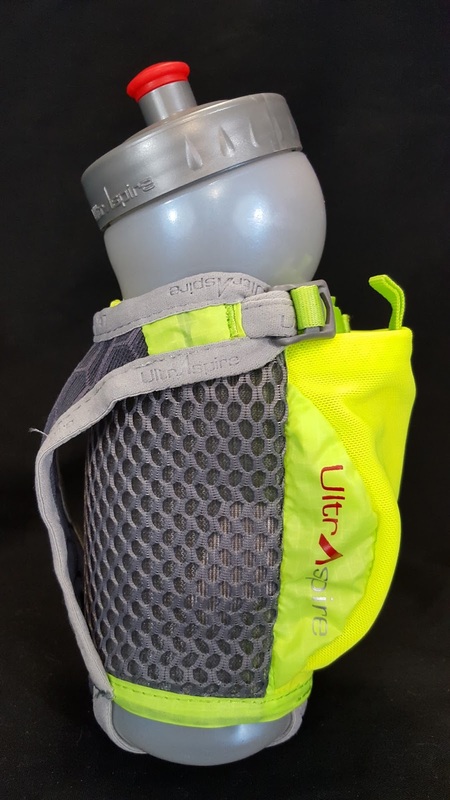 All UltrAspire products are covered under the warranty regardless of where you purchase it, but normal wear and tear is not covered. 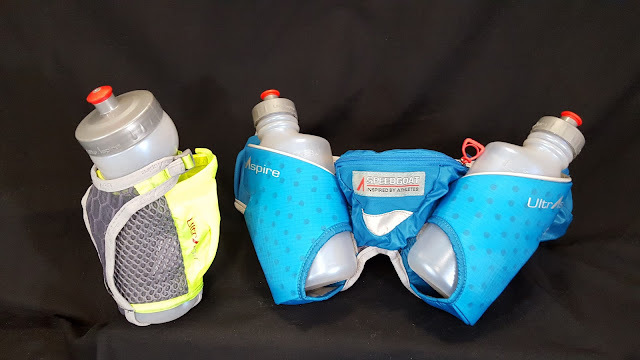 I was pleased with both of the UltrAspire products that I tested. They are comfortable and had some great features. Get yours today and be sure to tell me what you think.